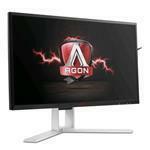 The new premium line of AOC gaming monitors is here: the AGON series. With the AOC AGON AG241QG you can enjoy clear and detailed graphics thanks to its Quad HD resolution (2560x1440), plus sharper action sequences with a 1ms response time and 165Hz refresh rate. The AG241QG also supports NVIDIA G-Sync technology to eliminate tearing, stuttering and input lag.